Our clients bought a new Toll Brothers home in Scottsdale, and since they enjoy having friends and colleagues over, they wanted to transform the front room to a fun entertaining area. They brought in the design firm Est Est to help them complete their vision. The project began with laying out the bar, the homeowners wanted to keep their view open from the glass entry door to their raised pool and waterfall in the backyard. 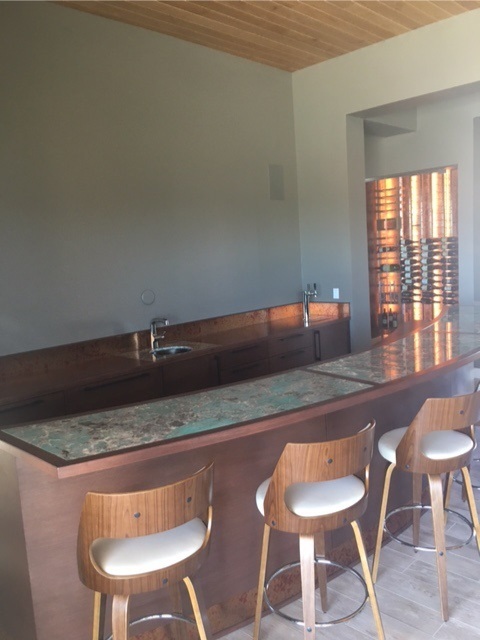 The main feature of the room is the wood bar with copper accents and an Amazonite slab top; the bar also included a dual tap kegerator, with refrigerator/freezer combo drawers. At the fireplace wall they added two floating benches inside upholstered nooks with custom copper chem metal art pieces above the fireplace. Another fun detail that the homeowner envisioned was a leather swinging saloon door leading into the kitchen. The homeowners were very happy with how their project turned out. They were hosting a large gathering in the middle of October, so they had a critical date that everything needed to be finished, and it was completed on time!